Copyright (c) 2013-2017 by Makoto Honda. All Rights Reserved. The basic requirements for all green plants include carbon dioxide found in the air, water, and some minerals such as nitrogen, phosphorus, potassium, etc, that the plants usually obtain from soil. The plants use sunlight to combine these elements and produce energy which they need to grow and reproduce. Plants generally grow well in soils rich in these mineral nutrients. The Venus flytrap awaits prospective meals, with its bright red trap lobes wide open, in native North Carolina, in July. There are places on Earth, however, where the soil is poor and does not contain all the minerals the plants need to survive. In places like bogs and swamps, the plants have a hard time obtaining sufficient nutrients from the soil. It is in such mineral-poor environments in some regions of the world that plants that acquired a rather unusual lifestyle may be found. In order to get around the problem of poor nutrition in the soil, some plants have developed a means of obtaining the nourishment they need from small animals such as insects and spiders. 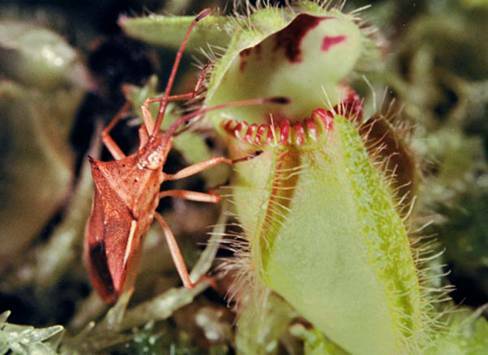 The leaves of these plants have been cleverly modified into various types of traps which not only capture prey but also digest them for food. 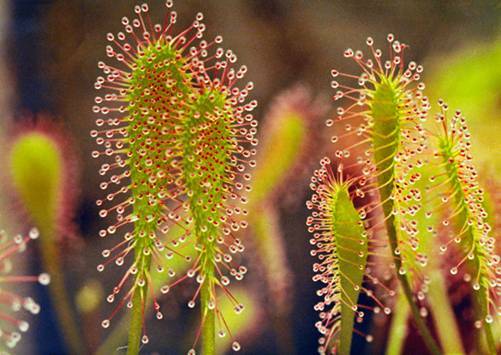 These unusual plants which have developed the meat-eating habit are known as "carnivorous plants." There are some 600 species of carnivorous plants in the world, and the continental United States harbors some 40 species. 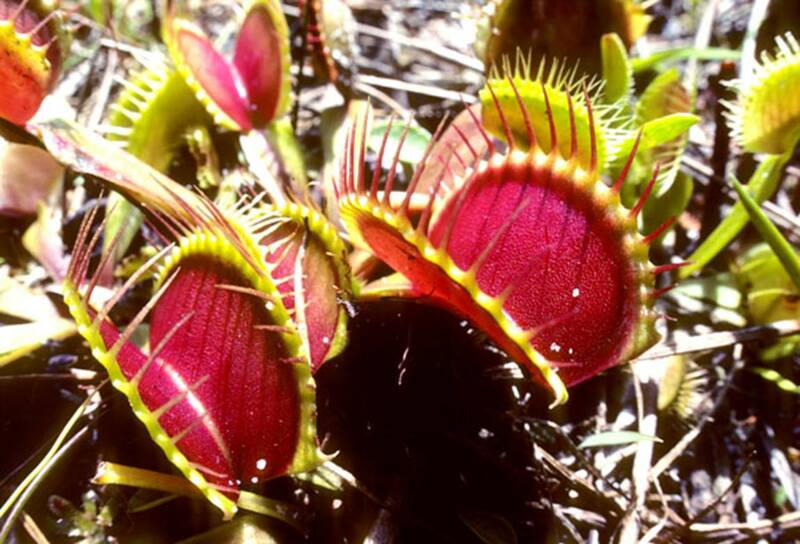 There are four major types of traps used by carnivorous plants: pitfall traps, flypaper traps, snap-traps, and suction traps. Pitfall Traps The simplest trap is a pitfall. The leaf has become a hollow tube, or a pitcher, which usually contains some fluids at the bottom. An insect is attracted to the pitcher because of its brilliant colors and sweet nectar. The edge of the pitcher opening is very slippery and often insects fall into the depth of the pitcher during the feeding. 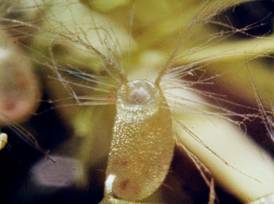 Once inside, it is almost impossible for the victim to climb out because of the down-pointing hairs growing on the inner surface of the pitcher tube. Thirty or so species of pitcher plants in North and South America, some 100 species of tropical pitcher plants mainly from the southeast Asia, and one species of Australian pitcher plant all use the pitfall trap to acquire animal prey. The Western Australian pitcher plant Cephalotus. Flypaper Traps In a flypaper trap, sometimes called an adhesive trap, the surface of the leaf is covered with tiny hairs each tipped with a crystal-clear droplet of sticky mucilage (glue). Any insect that lands on a leaf is immediately mired down with a sticky glue-like substance. Both sundews and butterworts use the flypaper trap to capture their animal food. There are about 150 species of sundews and some 100 species of butterworts in the world. 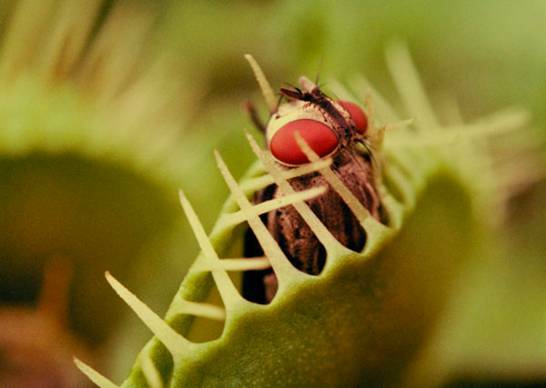 Snap-Traps The famous Venus flytrap uses a snap-trap, sometimes also called a steel trap or bear trap. In this trap, a clamshell-shaped leaf snaps from both sides with amazing speed when an insect enters. The force of the trap closure is so strong that the victim is often crushed. In this trap, the leaf has sensitive trigger hairs which trip the closing mechanism of the trap. Besides the Venus flytrap, only one species - an aquatic waterwheel plant - shares this most advanced and amazing method of capturing. Suction Traps The last method is a suction trap. This is found in a group of aquatic plants called bladderworts. 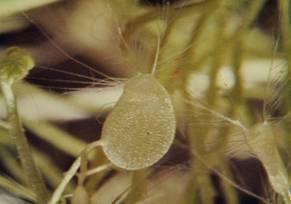 The plants bear a large number of tiny, sometimes microscopic, balloon-like sacs in the water (or in water-logged soil). When a tiny water animal approaches one of the sacs, it is instantly sucked into the trap and imprisoned inside. There are over 200 species of bladderworts worldwide. In this book, you will learn about each of these trapping mechanisms in detail as you read along. We will be focusing on representative species growing in the United States for the description of each trapping method. Copyright (c) 2013 by Makoto Honda. All Rights Reserved.